“The local as a reference for new mobilisations, solidarity networks and actions”. The number of people attending the workshop varied from 100 to 150 per day and a list of 150 registered for further communication. The organisers also provided the participants dinners at a social centre supporting migrants (see the programme here). The workshop included also a public event with keynote lectures by Margit Mayer, professor at the Free University of Berlin, Boaventura de Sousa Santos, professor at the University of Coimbra, and David Harvey, professor at CUNY Graduate Center (see the photos here), as well as a field trip in the centre of Athens including visits at grass-roots projects and discussions with local social movements. 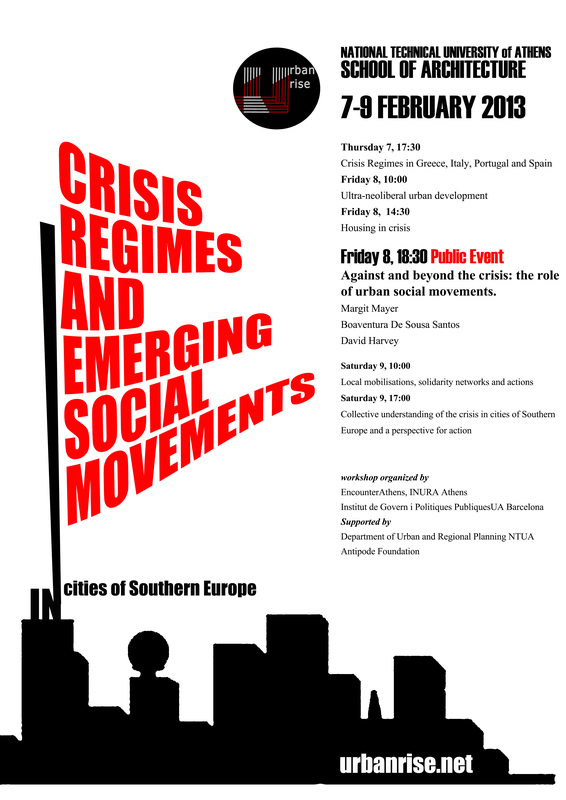 The workshop’s main goal was to bring together social movements and scholars from Greece, Italy, Portugal and Spain in order to [a] critically explore the consequences of the latest (financial) crisis on cities of Southern Europe, [b] exchange experiences of practices and struggles, and [c] collectively deliberate and debate ideas concerning radical action. One of the workshop’s major achievements was that it enabled a space of encounter among urban social movements in Southern Europe that was almost nonexistent before. By focusing on the specific region through the lens of locally rooted organisations and groups, the workshop was able to explore the commonalities and differences among the cities affected (to a lesser or greater extent) by the latest (financial) crisis and to question the measures and urban policies that have been proposed or implemented in the context of crisis-associated emergency. Another significant aspect of the workshop has been to challenge the strict divisions among scholars/researchers and activists and bring together people that belong to or are associated with both ‘identities’ in order to exchange experiences and ways of acting, and to think about ways of possible future actions. Moreover, throughout the workshop discussions, the issue of scale was raised; that is, which scale is the most appropriate for successfully acting upon certain demands? Since a lot of the initiatives presented were rooted in specific localities, the potential as well as the limitations of the local were debated. Similarly, the significance of the information and support provided by international networks, in which people and initiatives are also involved, was highlighted along with the limitations of active participation in such networks due to lack of resources and time, or due to difficulties in forming alliances. The state was also raised as a potential strategic terrain of (re)claiming power, albeit with difficulties of access, cooperation and goal-setting. The workshop brought together people that shared similar concerns to reflect on their lived experience, on their success and failures and on possible ways of mobilizing in the future. Through the workshop, informal networks of people were established, spreading mainly in cities in Southern Europe (but not only), through which exchange of practices and information is taking place and participation in collaborative actions is emerging. A blog has been set up for the workshop – http://urbanrise.net/ – on which all the materials – recordings, videos and presentations – have been uploaded. The blog also includes a map with all the participating initiatives and social movements. The workshop was publicised in several newspapers and blogs in Athens and through e-lists and other networks abroad. Particularly for Athens, this meeting had a major impact in the community of urban researchers and activists, attracted the interest of a wider audience (in particular, university students), and provided valuable insights on the manifestations of and struggles against the crisis in southern European cities. A brief summary of the workshop’s outcomes has been published in two journals (in Greek) and three collaborative papers have been prepared and are going to be published in the forthcoming edition of the peer-reviewed journal Geographies (again, in Greek). Moreover, presentations of the workshop and its discussions were given for university students within the context of particular courses.